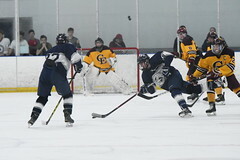 The Clippers suffered a disappointing 3-1 loss to Camden Hills in their last game before Winter Break. The loss drops Yarmouth to a record of 2-3-0. 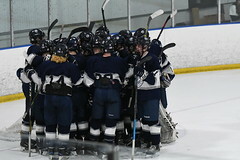 Yarmouth came out flying in the opening period and did a good job of finishing checks and contesting loose pucks. On the Clippers’ first power play, Sam Marjerison ’19 took the puck deep into the zone and threaded a nice, backdoor pass to Kurt Heywood ’19 who buried his shot to give Yarmouth a 1-0 lead. Spencer King ’20 was credited with the secondary assist. Despite having to kill a five-minute major penalty, the Clippers preserved the 1-0 lead through the opening period. 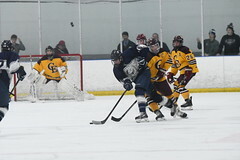 In the second period, Camden Hills picked up a short-handed goal to even the score. Late in the period, Camden Hills took advantage of the home team’s last change on a face-off in Yarmouth’s zone to get a match-up they wanted. Following the face-off, the Clippers were unable to get the puck out of their zone and Camden Hills picked up the go-ahead goal. Just over a minute later, Camden Hills extended the lead to two goals with a power-play tally. In the final period, the Clippers failed to win races to loose pucks and struggled to generate quality scoring opportunities. In net, Charles Henry Watson ’22 made 19 saves on 22 shots. The Clippers will head to Connecticut over school vacation for two games and then will face five games over a nine-day span starting January 3rd.